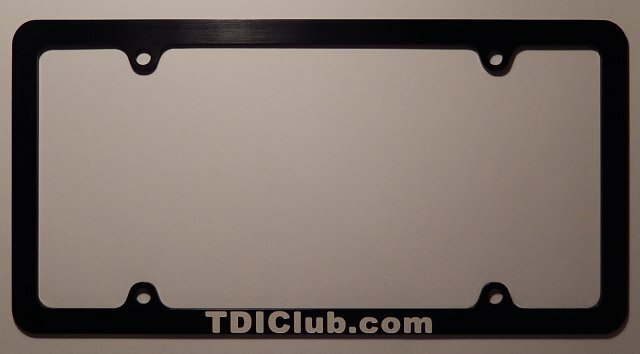 Below is a list of official TDIClub.com items. From the sales of these items, 100% of the proceeds are used to support the site. Shipping details are at the bottom. You will get a confirmation email when products ship. 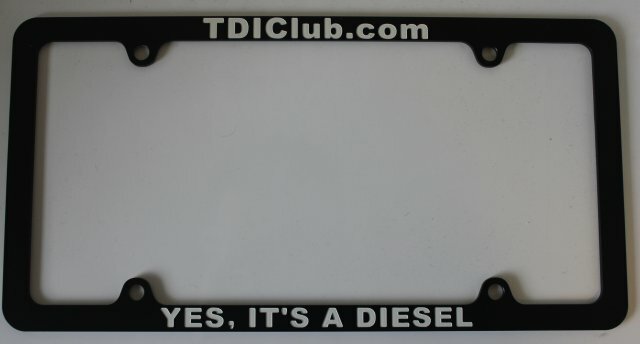 These made in Canada plastic frames have large text at the bottom that says "YES, IT'S A DIESEL" and TDIClub.com on the top. This works well in some states and provinces, but not all as sometimes the registration or insurance stickers need to be located on the bottom of the license plate or between the upper screw holes. If this is the case where your vehicle is registered, you will need a Type 3 frame as some law enforcement officials my not like it. The cost is $8.00US a frame plus shipping ($2.00US minimum). To order the T1 frames, click the above "PayPal" button, or see below for other payment options. 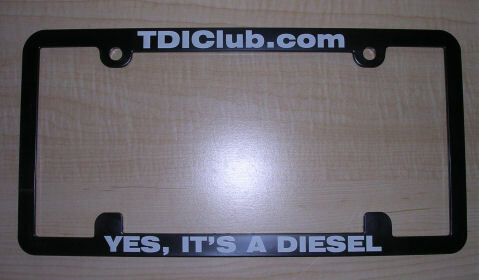 These made in Canada plastic frames have text at the bottom that says "YES, IT'S A DIESEL" and TDIClub.com on top. This is legal in all States and Provinces as no spots insurance or registration stickers are not covered up, but the "Yes, it's a diesel" text is a little less visible than the Type1 frames. The cost is $8.00US a frame plus shipping ($2.00US minimum). To order the T3 frames, click the above "PayPal" button, or see below for other payment options. 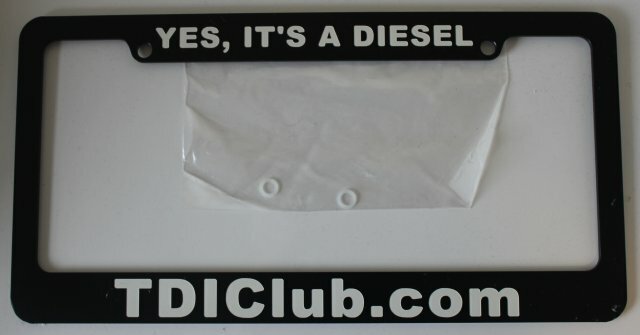 "Yes, It's a diesel" slogan. These 100% American made billet aluminum frames by Billet Frames are both polished and anodized, are clear coated, sealed with a polymer urethane sealant, and waxed to resist road salt and direct sunlight. They have large text at the bottom that says "TDIClub.com" and nothing on the top. This style is legal in states and provinces where there are no insurance or registration stickers that are placed on the botom of the licence plate or between the two upper screws. If this does not work in your state or province, I recommend purchasing the "Type 3" below that have a thin top and bottom as it will not cover these stickers. The cost is $30.00US a frame plus shipping ($3.50US). 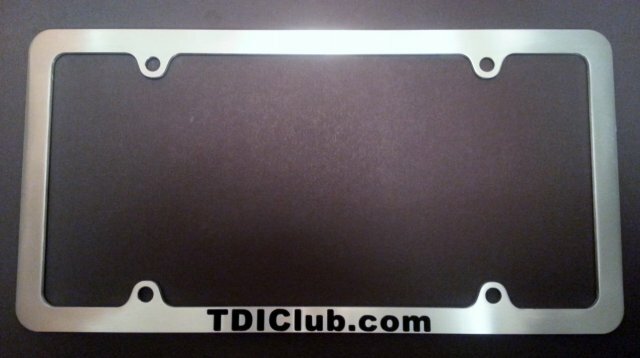 To order the aluminum T1 frames, click the above Chrome or Black "PayPal" button, or see below for other payment options. These 100% American made billet aluminum frames by Billet Frames are both polished and anodized, are clear coated, sealed with a polymer urethane sealant, and waxed to resist road salt and direct sunlight. 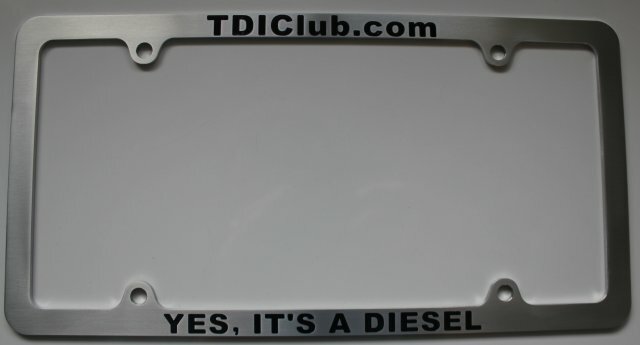 They have large text at the bottom that says "YES, IT'S A DIESEL". on the bottom and TDIClub.com on top. This style is legal in states and provinces where there are no insurance or registration stickers that are on the botom of the licence plate or between the two upper screws. If this does not work in your state or province, I recommend purchasing the "Type 3" below that have a thin top and bottom as it will not cover these stickers. The cost is $30.00US a frame plus shipping ($3.50US). To order the aluminum T1 frames, click the above Chrome or Black "PayPal" button, or see below for other payment options. These 100% American made billet aluminum frames by Billet Frames are both polished and anodized, are clear coated, sealed with a polymer urethane sealant, and waxed to resist road salt and direct sunlight. They have large text at the bottom that says "TDIClub.com" on the bottom and nothing on the top. This style is legal in states and provinces where there are no insurance or registration stickers that are on the botom of the licence plate. If this does not work in your state or province, I recommend purchasing the "Type T3" below that have a thin top and bottom as it will not cover these stickers. The cost is $30.00US a frame plus shipping ($3.50US). To order the aluminum T1 frames, click the above Chrome or Black "PayPal" button, or see below for other payment options. These 100% American made billet aluminum frames by Billet Frames are both polished and anodized, are clear coated, sealed with a polymer urethane sealant, and waxed to resist road salt and direct sunlight. 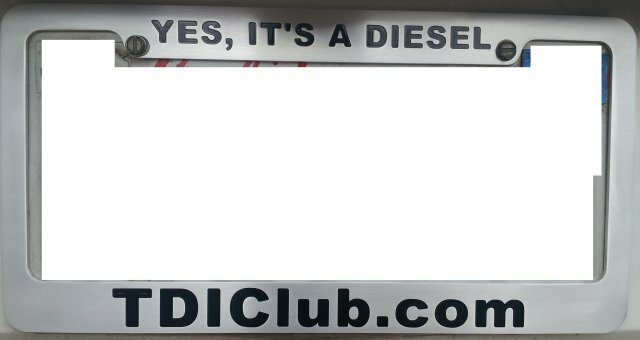 They have text at the bottom that says "YES, IT'S A DIESEL" on the top and "TDIClub.com" on the bottom. This is legal in all States and Provinces as no spots forasdfasdf insurance or registration stickers are not covered up, but the "Yes, it's a diesel" text is a little less visible than the Type1 frames. The cost is $30.00US a frame plus shipping ($3.50US). To order the aluminum T3 frames, click the above Chrome or Black "PayPal" button, or see below for other payment options. These 100% American made billet aluminum frames by Billet Frames are both polished and anodized, are clear coated, sealed with a polymer urethane sealant, and waxed to resist road salt and direct sunlight. 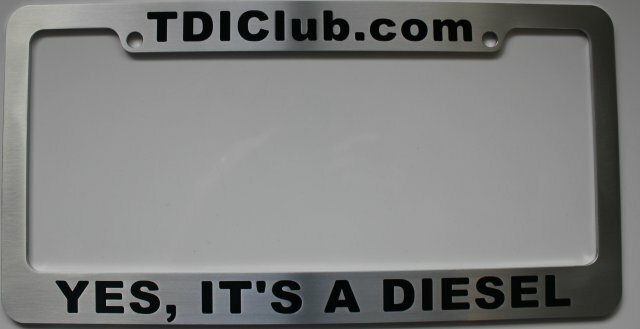 They have text at the bottom that says "TDIClub.com". and nothing on the top. 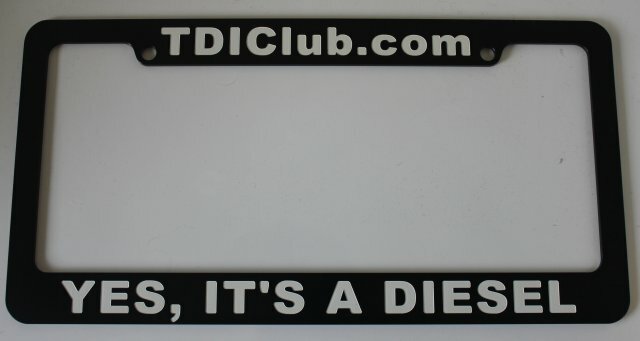 This is legal in all States and Provinces as no spots insurance or registration stickers are not covered up, but the "TDIClub.com" text is a little less visible than the Type1 frames. The cost is $30.00US a frame plus shipping ($3.50US). To order the aluminum T3 frames, click the above Chrome or Black "PayPal" button, or see below for other payment options. The smaller stickers are $2.00US plus shipping ($2.00US minimum) and the larger one is $2.50US plus shipping ($2.00US minimum) To order the sticker, click the above "PayPal" button, or see below for other payment options. 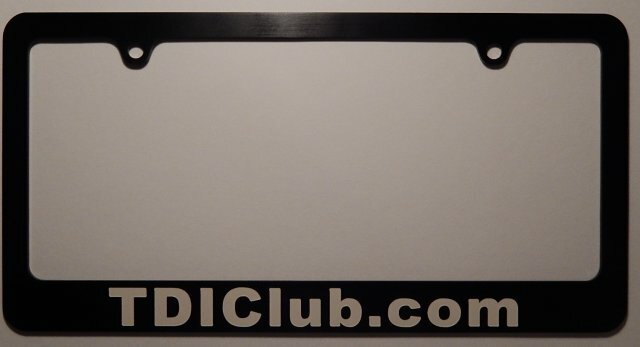 BLACK TDICLUB.com sticker. These are commercial vinyl rated for 5-7 years of outdoor use and are machine cut and not printed. This means there is no background to worry about. The size of these stickers is approximately 1.5 cm x 16 cm (6.5" x 0.75" ). $3.00US plus Shipping ($2.00US minimum). To order the sticker, click the above "PayPal" button, or see below for other payment options. 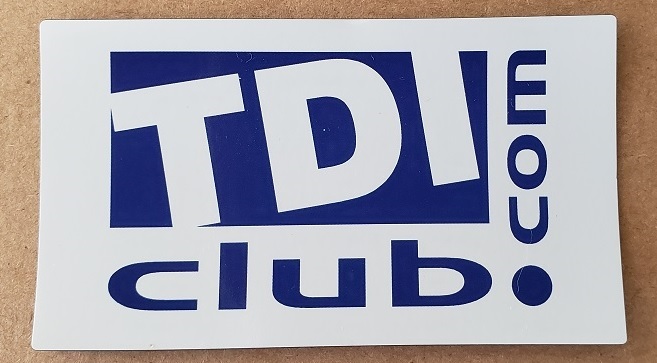 WHITE TDICLUB.com sticker. These are commercial vinyl rated for 5-7 years of outdoor use and are machine cut and not printed. This means there is no background to worry about. The size of these stickers is approximately 1.5 cm x 16 cm (6.5" x 0.75" ). $3.00US plus Shipping ($2.00US minimum) To order the sticker, click the above "PayPal" button, or see below for other payment options. TriColoured TDICLUB.com sticker. These are commercial vinyl rated for 5-7 years of outdoor use and are machine cut and not printed. They have a green T for economy, red I for performance and the other letters are in silver. This means there is no background to worry about. The size of these stickers is approximately 1.5 cm x 16 cm (6.5" x 0.75" ). $4.00US plus Shipping ($2.00US minimum) To order the sticker, click the above "PayPal" button, or see below for other payment options. 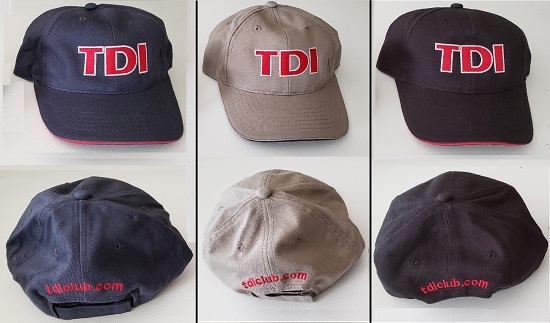 These TDIClub baseball hats are adjustable and come in three colours, beige, blue and black with red TDI lettering on the front with tdiclub.com embroidered on the back and a red contour edge. 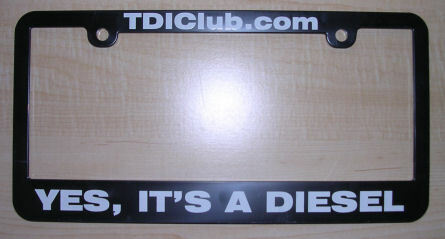 Show your support of TDIClub and TDIs in general all while keeping cool. The regular price on these are $20.00US plus $5US shipping, but for a limited time they are available for $20US including shipping. 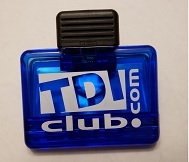 Currently you can add a TDIClub Pen and/or TDIClub magnetic clip for $2.00 each. Please note that shipping to Canada is an additional $5.00US and it will be sent as a second invoice after you order. To order the sticker a hat, select youu colour (beige is the default) and then, click the above "PayPal" button, or see below for other payment options. These quality blue metal click action pens with chrome trim are laser engraved with TDIClub.com and include a clip. $2.00US plus Shipping ($2.00US minimum) To order the pen, click the above "PayPal" button, or see below for other payment options. These blue 2" x 3.5" fridge magnets can be used not only in the kitchen, but on your favorite toolbox as well. $2.00US plus Shipping ($2.00US minimum) To order the magnet, click the above "PayPal" button, or see below for other payment options. These blue carabineers have TDIClub.com on them and are approximately 2" x 3" and include a compose. It is a great item to attach your things to your bag or another item you would normally use a promotional carabineer for. As you can guess, this is NOT for climbing. $3.00US plus Shipping ($2.00US minimum) To order the carabineer, click the above "PayPal" button, or see below for other payment options. 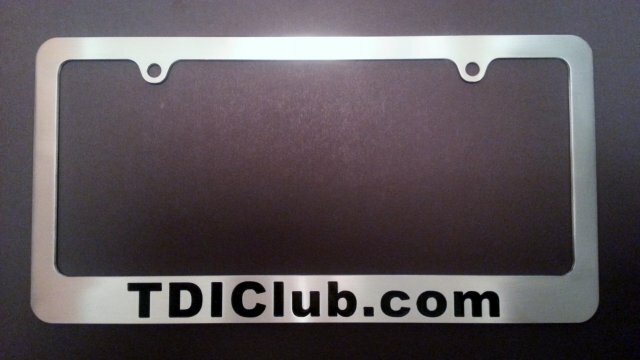 Limited run laser engraved TDIClub stainless steel 15 oz. tumbler with foam insulation. Made with FDA compliant materials, the dual wall 18-8 stainless steel construction and foam insulation ensures maximum heat retention. The twist action, spill resistant lid and non skid bottom provide convenience and stability. Dimensions: 8 1/8" x 3 1/8" x 3 1/8" (H x W x D). $25.00US plus $5.00US Shipping. Since this is shipped from a 3rd party shipping cannot be combined with other orders. Please note that shipping to Canada is an additional $7.00US and it will be sent as a second invoice after you order. To order the mug, click the above "PayPal" button, or see below for other payment options. 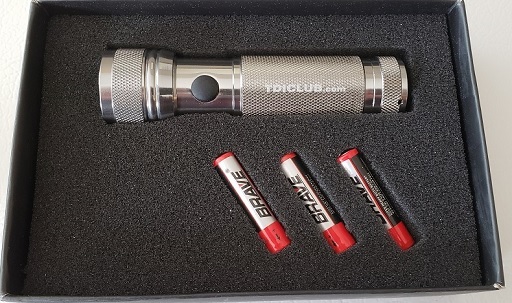 Limited run laser engraved TDIClub.com 12 LED flashlight in a gift box. $8.00US plus Shipping ($5.00 minimum) To order the flashlight, click the above "PayPal" button, or see below for other payment options. Paypal is a online service that lets one pay via their PayPal balance or by a credit card. If you do not wish to pay via this means you can do so by sending a cheque or International Money Order (please no Green Postal Money orders that say "Negotiable only in the US and Possessions") to me directly. Send me an email for my postal address. Once payment has cleared PayPal or my bank, items are normally sent out within a week, and delivery time after that depends on the postal system (often 2-3 weeks). Shipments are made to both Canada and the US. For other countries, please send me an email. for more details.